BOOM ISLAND PARK, Minn. –Sen. Amy Klobuchar (D., Minn.) responded to reports that she has mistreated her staff for years following the announcement that she would be entering the Democratic field for president by saying she can be "tough" on employees because she has "high expectations." "Yes, I can be tough, and yes I can push people," Klobuchar said Sunday afternoon at Boom Island Park just outside downtown Minneapolis. "I have high expectations for myself, I have high expectations for the people that work for me, but I have high expectations for this country." Klobuchar was responding to reports that surfaced last week leading up to her announcement in both The Huffington Post and BuzzFeed in which former staffers described how the Democratic senator was prone to bursts of cruelty, left some staff members crying, and created a cloud of anxiety looming over the office. 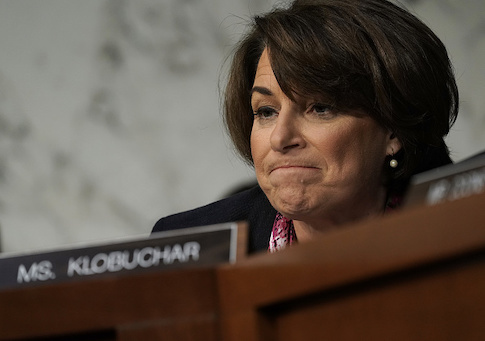 The staffers talked of how Klobuchar would send angry messages to her staff members and threaten to fire her employees over email. Klobuchar would also throw objects in temper tantrums inside the office, once inadvertently hitting a staff member in the head with a binder. "I've always been taught that your true character shows in how you treat those with less power than you, especially behind closed doors," a staffer told BuzzFeed. "The way Sen. Klobuchar behaves in private with her staff is very different than when she's in the public eye, and that kind of cruelty shouldn't be acceptable for anyone." Staffers additionally said Klobuchar would make them perform personal errands, such as washing her dishes in her home, booking personal appointments, and picking up her dry cleaning. The Democratic senator's reputation has also allegedly made it difficult for her to find aides for the presidential campaign.